Oh man - it's time to delve back into the deep, dark world of imitation hot dogs. An old friend of mine recommended these way back when I first started this blog (Hi Leah! ), so I hope she's still reading. Here we go! After the two-part Smart Dog debacle, I wasn't expecting much from Lightlife's other version of the hot dog: Tofu Pups. I was a little encouraged by the fact that it had no gluten - that's usually the major factor in things that taste gross. This dog is straight soy. With other stuff, of course, but no gluten. Since I'd gotten yelled at by some random internet user for not following the package directions for cooking those gross things before, I decided to go by the metaphorical book. I cut the slits in the dogs and microwaved them for the prescribed amount of time. While that was happening, I was getting my macaroni and cheese ready. I was feeling optimistic on these. Once the pups were ready to go, I cut off a chunk and checked it out. This was first accomplished by squeezing it between my index finger and thumb to assess the texture. Gotta say, hilariously squishy. The texture struck me as intensely amusing. It was very… springy. Yeah, let's go with that. Springy. I went ahead and put it in my mouth anyway. Oh wait - first I have to discuss the smell. The odor that emitted from the microwave when I took the dogs out was absolutely foul! I was not looking forward to tasting this item. Luckily, it did not taste like it smelled. It didn't really taste like anything, truth be told. And that's not because I was holding my breath or anything. It really tasted like nothing. I even tried it with a bite of my macaroni to see if it would disappear into the mac and cheese, leaving only a hilariously spongy texture. Oddly, it imparted a weird unpleasantness to the mac and cheese. Not a great combo. Not ready to give up yet, I tried it in a more traditional hot dog setting. With ketchup! Now we're talking. It absorbed the ketchup flavor without competing. Very symbiotic. It lent a pleasantly squishy texture to the ketchup, and the ketchup provided a nice flavor to the flavorless hot dog. If I'd had any hot dog buns, I'd have tossed one on a bun and gone full hot dog on that bad boy. But that's for another review. I finished eating that whole pup, in chunks, with ketchup, next to my macaroni and cheese, and it wasn't too bad. One more note on the texture - I don't know how many of you out there have eaten those super cheap real-meat hot dogs. You probably know the ones I'm talking about - they cost about a buck for a package, and you just know that they can't be more than fifty percent meat? And certainly not from any recognizable cut. Well, the Tofu Pups had the texture of those down exactly. Nailed it! Something occurred to me during the testing of this product. Many sausage-like products that fake meat producers attempt have a pretty strong flavor that is easy to impose on whatever fake meat element you're using. Breakfast sausage, Italian sausage, chorizo, kielbasa (stay tuned! ), all have their own distinctive flavor profile. Hot dogs, though, are mainly about the meat (or "meat") contained within. They don't have a special "hot dog" flavor to try to imitate. This may make the job more difficult. That's all I'm sayin'. After the description, I was expecting a lower grade. I tried tofu pups tonight. I also followed the directions to a T. All I can say is GROSS! Flavor was gross, texture was gross and I could smell the foul pup stench as they cooked. I tried covering them with chili, cheese and onions. I got halfway through the pup, fished it out and threw it in the trash with the rest of them. What a wasts of money. These taste the same as all of the other soy dogs out there, just bad. Rubbery, terrible aftertaste. This should've been an F like the rest of them. The morning start hot dogs were awesome. To bad they discontinued them. All the others are gross. 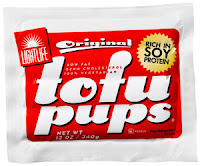 Sorry to disagree with everyone, but I like tofu pups. And they're the only ones I can find that don't contain wheat - kind of a plus when you have a wheat allergy. I also like tofu pups. I served them to my daughter and her friend and they ate them without complaint. (They are preschoolers and never had any hotdogs before. Now that the great weather is here, there are lots of hot dogs and hamburgers at get togethers and it is good to know I can bring tofu pups and veggie burgers. I like tofu pups! I'm gluten free, and they are like the only ones that don't have gluten. Definitely an acquired taste though - I used to have to eat them smothered in ketchup and mustard, but now I can eat them plain. I know this is an ancient blog post but I was looking for reviews of these AFTER buying a package and choking one down. Just awful! The texture makes me want to gag. However, the Tofurky hot dogs are actually pretty good. I look forward to going back to them after finishing up this package of crap! I just ate them for the first time....really gross. I have to throw the rest of them away. I love tofu pups. Package recommends sitting in boiling water for 2 minutes. They are great with mustard and relish! I'm gluten intolerant and tofu pups are about my only choice. I've always thought they were OK. I don't understand the "GROSS" reactions above. At least their bland flavor isn't overpowered by PEPPER. Lightlife Tofu Pups, this time, on a stick!